“Walter,” the hailstone preserved by Cullman Tribune reporter W.C. Mann, is the largest recorded stone in Alabama history, and the second largest ever officially recorded east of the Mississippi River. CULLMAN COUNTY, Ala. – On March 19, 2018, Cullman County was struck by a hailstorm of historic proportions. While no lives were lost to the system that produced the hailstorm, versus two lives lost to the April 27, 2011 tornado in Cullman County alone, the economic impact of the hailstorm rivals and may ultimately exceed that of the tornado. Starting around 7:10 p.m. on March 19, the pathway of the hailstorm began around Good Hope and included the Deer Trace subdivision north of that city, across the interstate from Cullman’s south side. Sweeping eastward into Cullman, the storm affected almost every business along the Cherokee Avenue retail corridor, as well as residential areas to the north and south of the thoroughfare. Hail hit the Fox Meadow, Carroll Acres and Arbor East subdivisions before the storm followed Bolte Road out of town on its way toward Welti. The last concentration of large hailstones fell around the Walter community, where Alabama’s current state record hailstone was recovered. Cullman County’s storm warnings expired at 9 p.m.
Cullman County’s storm was part of a large system that spawned more than 20 tornadoes in Alabama, including an EF-3 that struck Jacksonville State University, and produced damaging hail in a path all the way from Texas to Florida. The total cost of the system’s effects is estimated to be $1.5 billion. Thanks in part to warnings issued by meteorologists beginning days in advance, there were no fatalities in Alabama. Cullman Industrial Parks I, II and III, along with the city’s Industrial Complex (home to REHAU and others) and industrial developments along Old Hanceville Highway suffered extensive damage to roofs and roof-mounted equipment. Multiple industrial sites, while not releasing official numbers, reported building repair costs of more than $1 million each. “You just think about everybody working at those plants at the time that storm came through; their cars were sitting out there. None of them had garages or covers or those areas. So it got the cars there just like it did those at Mitch Smith (Chevrolet). Something you don’t even think about until you get to looking. Cullman City Risk Manager Tom Charney shared that Cullman suffered slightly less than $6 million in damage to City buildings, properties and vehicles. Particularly affected were Fire Station II on Main Avenue, Heritage Park, Cullman Wellness and Aquatic Center, the Donald E. Green Senior Center and the Cullman Civic Center. Additionally, 32 city vehicles were damaged. Cullman County Commissioner Garry Marchman reported that construction and contractor costs for repairs to County facilities like the sheriff’s office and Cullman County Detention Center have reached $7,988,672. The County has also spent an additional $2,031,848 on other recovery expenses, including engineering and architect fees, among others. Businesses and homes from Good Hope to the Walter community were affected, but, thanks to the sharing of eyewitness and security camera videos via social media, the Marktplatz Center (a Drinkard Development property) and Mitch Smith Chevrolet became icons of the storm’s destructiveness. Continuing recovery projects focus on completing the replacement of approximately 500,000 square feet of damaged roofing and the replacement of roof-mounted HVAC units that have been in short supply due to the number of businesses and industries across the region ordering them. Mitch Smith General Manager Paul Schaffer said that vehicle damage on the dealer’s lot totaled $4.9 million. Hail struck approximately 370 vehicles, with 120 declared totaled. The damage averaged $14,000 per vehicle. Another $800,000 in damage occurred to the building, which is still undergoing final repairs. 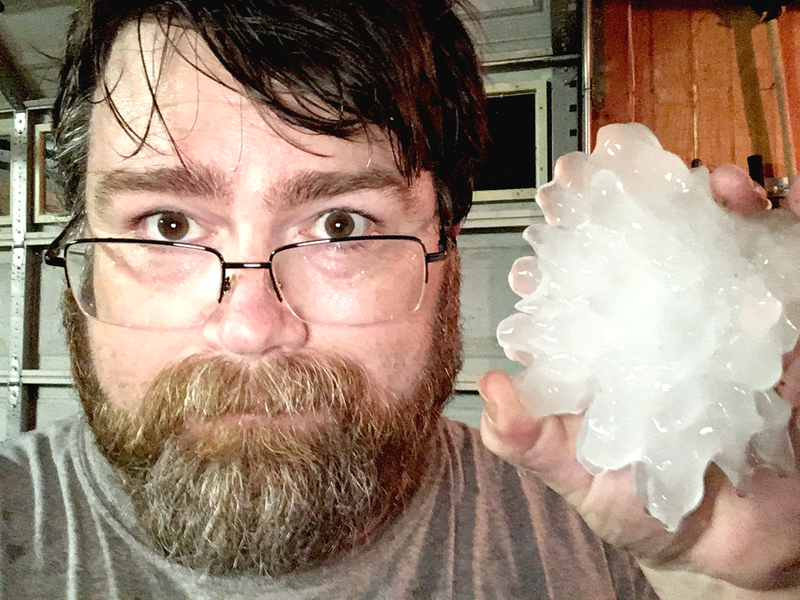 “Walter,” the 5.38-inch hailstone recovered in the north Walter community, was declared the official Alabama state record and is the second-largest hailstone officially recorded east of the Mississippi River, behind a 5.7-inch stone that fell on Wassau, Wisconsin in 1921. The largest in U.S. history fell on Vivian, South Dakota in 2010, and was measured at 8 inches. The now-famous photograph of W.C. Mann holding the hailstone was originally posted to social media for local view, but, within 30 minutes, appeared on a television news broadcast in Atlanta, a little while later in Boston. The photo has now circled the globe, appearing on weather pages in Asia and Europe. Initial reactions to the photo were skeptical, especially after a hailstone image that appeared in other local media was shown to have been doctored. Examinations of the stone by the National Weather Service Huntsville office, though, confirmed its authenticity and approximate size. Subsequent laser scans by the Insurance Institute for Business and Home Safety (IBHS) showed that it had a maximum diameter of 5.38 inches along its longest axis, weighed more than half a pound, and had a total volume of 19.8 cubic inches. According to the IIBHS, a baseball has a volume of about 13.4 cubic inches. Today, Walter and four other hailstones reside in a generator-protected freezer at the NWS Huntsville office pending transfer to the state climatology office at the University of Alabama in Huntsville, where they will be preserved for study and could even become part of a future museum-style display on Alabama weather history.